I think her birthday is May 19, 1922. That makes her Korean age 92 this year. Korean age accounts for the time a baby is in the mother’s womb. She came from a well to do family, I seem to recall, but they lost their money/fortune. Park Kung-Hee worked for the Salvation Army (SA) and was a vice-chair of women’s side at the time. She gave speeches and visited Los Angeles as a Korean ambassador for a sports event, also visiting San Franciso about that time. She met her husband, whose family were farmers, at the SA because he also worked there. In 1965, she and her husband were asked by SA to start an orphanage in Kunsan, Korea, which they did. When the Salvation Army wanted to move them to another position/work, they felt God’s calling them to continue to work for the orphanage, so they retired in order to stay there. It was a difficult time in Korea, with many babies being abandoned. The two babies I adopted. After Mrs. Park retired from SA, she used some of her financial assets and all of her retirement funds to buy more land for the orphanage as well as more goats. The facility was too small for the number of babies at the time. I visited the Ilmagwon Orphanage ( or Il Maek Won) for the first time in 1972 where about 100 babies, children under 5 years old, lived. I met Mrs. Park and her family who lived above the orphanage. I arrogantly thought she was old back then, but I was barely twenty, so that can be excused. Her sweet spirit was evident even then, when I took home two of her babies as my own. She has kept records of each child who has lived with them. Mrs. Park is a godly, Christian woman, and I am sure no one can count the number of people she has touched through 92 years. 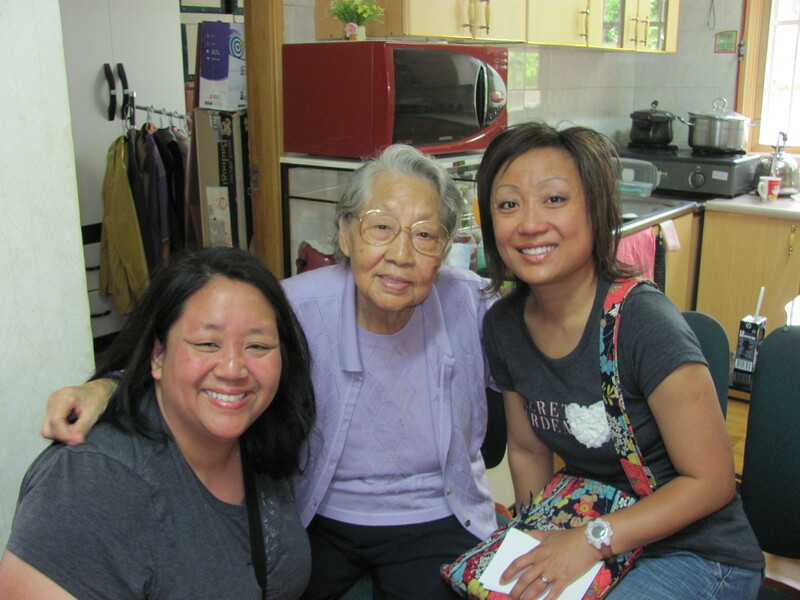 After almost 40 years, I went back to the Korean orphanage and visited her in June of 2012. Her gentle spirit welcomed my grown daughters and I. Treasure, one of my Korean daughters, said, “Mom, I think I would have known about God even if I had stayed in Korea.” I agree, because Mrs. Park would have made sure of that, just like she did the other orphans. When I told Mrs. Park that my husband had left me soon after adopting the two babies, she said, “It must have been hard for you to raise daughters by yourself.” Such graciousness from a woman who literally raised hundreds of children herself! Meeting Mrs. Park was the highlight of my trip to Korea. God reminds me that He has placed saints in strategic places all around the world to glorify Him and to do His work. It is then when I saw your post! Naturally, since Google is my friend.. I Googled your name and it brought me here! I want to thank you for this post and picture that you shared of Mrs. Park. This was the first picture I had seen of her other than a picture I was in while at the orphanage in the early 70’s. She had given me the Korean name that I have right now. My last name is also Park. I would love to chat with you if you are interested. My brother and I were both adopted from Il Meg Won in 1979. I was 7 and my brother was 3. We are not biological siblings but you would never know that now. I have ran across many Korean Adoptees but none from Il Meg Won. I don’t remember Mrs. Park but Mr.Kim or Grandfather Kim is what we all called him. I don’t remember much other than he always wore white v-neck t-shirt no matter the weather. I would love to hear from you or your daughters to see if they were there when we were. Wow! Thanks so much for writing! We were probably there about the same time! We wondered how would we EVER be able to pick only one child. Well—SHE PICKED US!! Whenever we would sit on floor all the children would want to sit on your lap to get some personal attention that was so hard to get when you had 100 other children to compete with. We chose our daughter because whenever she would sit on our lap, if others came close, she would PINCH THEM to let them know ” get away!! –he’s mine!! Thanks so much for your sites. Really appreciated reading about Mrs. Park and Cindy has often wondered how she could contact her to let her know how she’s doing. What is the best way, do you know? I do have quite a few pictures of the orphanage and children (including Treasure, I’m sure) and would be glad to post if you’d like. Thanks again for your effort and help in trying to keep a connection between those from this remarkable home. So great to get your letter. I would love to see pictures. We have now found about 6 people who were adopted from the orphanage about that time! Barbara, so you have pictures of the kids in the Ilmagwon orphanage from the 1970’s? Would love to have you post them! Barbara, I would love to see pictures also! It looks like we may have all been at the orphanage during some period between 1971-1974. This is amazing. Thank you again Kathryn! Through you and your daughters, we have all been brought together. I am so happy about this too. I could never imagine how my longing for the babies I left in the orphanage would be answered! You know, I cried when I visited the orphanage and looked at the books with all the babies from that time period because I recognized so many! I didn’t realize how my heart had been burdened. Barbara, to get in touch with Mrs. Park you would write the orphanage director — her son Mr. Kim. Mrs. Park lives right beside the orphanage. Do you have an address and an email for Mr. Kim and Il Maek? My son was there until 1985 when we adopted him. Thank you.